The first thing Bernie Ray looks at when the Diamondbacks announce their schedule is the promotional games. She hasn’t missed one of them. After all, an A.J. 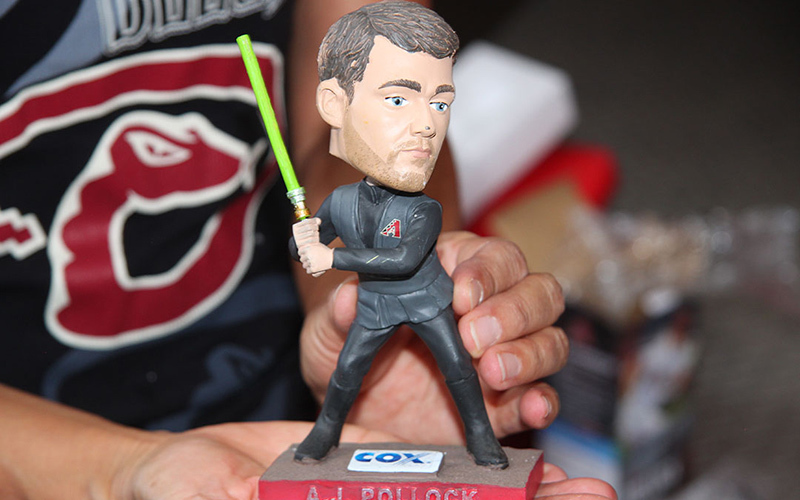 Pollock Star Wars bobblehead is worth planning for. They came in droves for the eight Saturday promotional nights the Diamondbacks have conducted during the 2015 season. On these nights, the Diamondbacks average attendance skyrockets to 34,770, a 9,003 increase from their season average. Two more Saturdays are scheduled in August. Driving ticket sales is key for a Diamondbacks organization 23rd in the league, averaging 25,767 fans in 53 home games. The Diamondbacks use a strategy called “Peak-on-Peak,” utilizing promotions and giveaways on the games/days the team thinks fans are more drawn to, whether it’s for the opponent, the day of the week or a combination of the two. Karina Bohn, in her third year as the Diamondbacks vice president of marketing, said giveaways help draw more fans into the games they otherwise may not go to and possibly draws them to future games. Ray, a half-season ticket holder, is a prime example. According to her friend, Bradley Banning, Ray makes sure she is at every giveaway she can get to. SportsCastor Marketing Inc., is based in Phoenix, and most notably works as the exclusive sponsorship marketer for the Angels and the A’s, and the exclusive local partnership market for the Cubs during spring training. Castor started SportsCastor Marketing Inc., after serving 14 years as the Arizona Cardinals director of marketing from 1988 to 2002.